Order your noodle or rice boxes, mee goreng and Mongolian beef, from a Noodle Box restaurant near you. Get Noodle Box delivered to your door! If you’re craving the dishes of Southeast Asia, Noodle Box aspires to bring the flavours or hawker food markets to Australia. Inspired by the power of the wok Noodle Box’s highly trained wok chefs take fresh ingredients and fry them up, creating that appetising, wok-charred flavour that’s central to the cuisine. 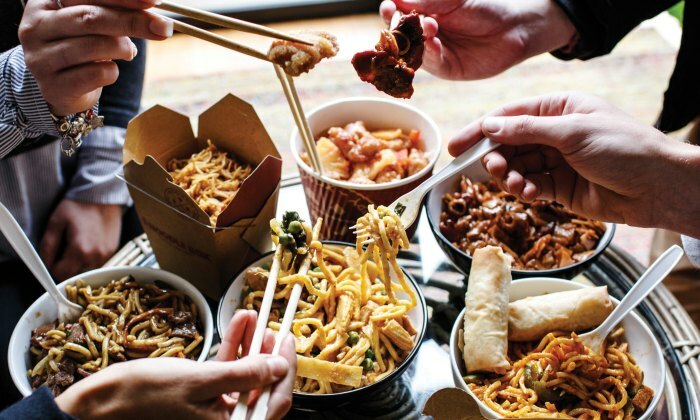 Noodle Box aims to transform the simplest of ingredients into a Southeast Asian feast, ever since the first store in 1996 opened. Today, there are over 80 restaurants serving up an ever-evolving menu of wok inspired, market fresh creations. Choose from either noodle or rice boxes, and a huge range of flavours, including garlic prawns, mee goreng, pad Thai, Mongolian beef, Nasi goreng and more. Plus, side such as pork buns, spring rolls, dim sims and panko prawns. You don’t need to travel to Southeast Asia to satisfy your craving, when Noodle Box has a huge range of delicious noodle and rice options. And, the best part is that you don’t need to visit a restaurant if you haven’t got the time. Simply place your order via Menulog, and you’ll soon be slurping of delicious noodle dishes.